We’ve made it to the end of day five of construction today! One third of the way through and this is the time the construction team hand over to services! We’ve had another early morning here at the Desert Rose site. This morning I woke up so ridiculously tired after too little sleep. At 5:15am, my alarm went off as my roommate, Dan, and I started our day with a high-five from our beds followed by a collective groan as we crawled out of bed to get ready and head to the bus. Today we installed the last of the roof modules to the house. This process not only saw the completion of the structure of the house, but it has also set up the house for power! 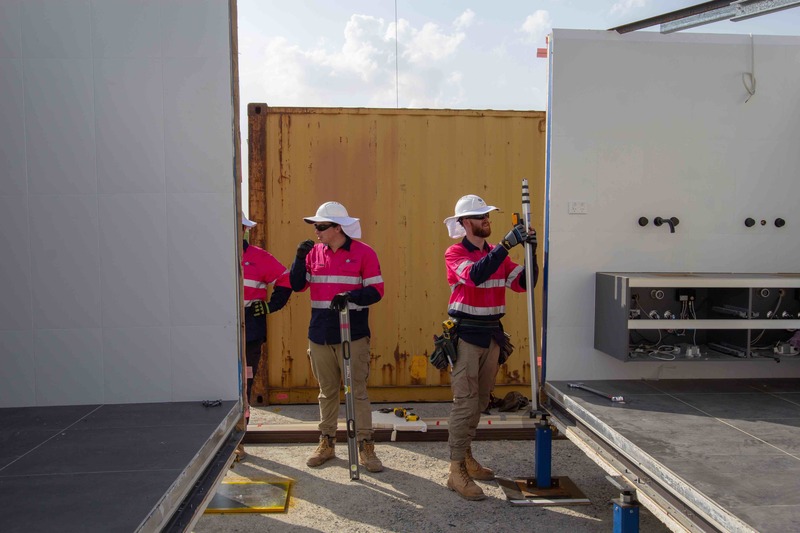 It’s a careful process, ensuring the correct wires are connected before the roof is secured to the walls and unhooked from the crane. The process of connecting the house begins as each roof module is taken out of the shipping container and set on the ground. Lachlan, Tyler, Gustav and Macleay and myself are then under the pump to prepare the cables, which involves stripping back the insulation around it to expose the copper for connection, as well as double checking everything is in place, testing the continuity of the cables and ensuring nothing is broken. Other team members are adding insulation as quickly as possible in the roof sections to ensure we can reduce our internal heating loads as much as possible. The module then gets connected to the crane and taken up over the house into position. 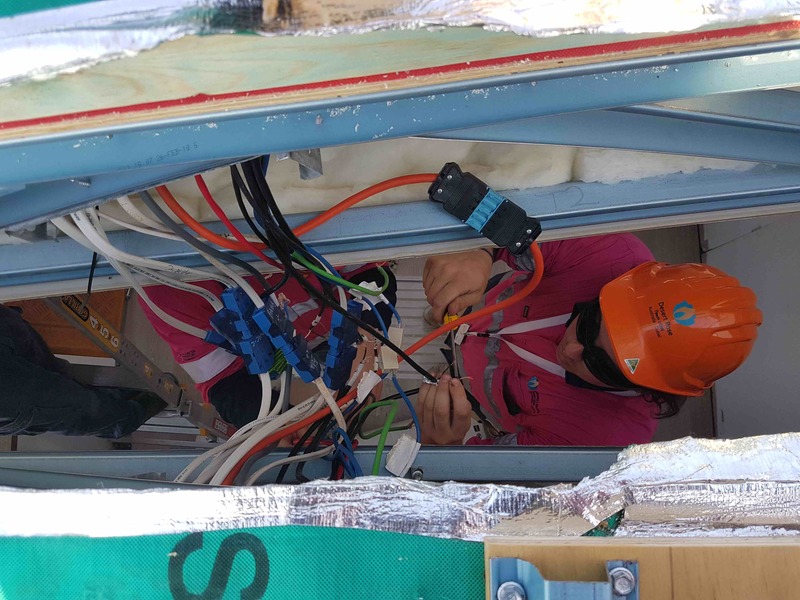 Once the roof module is in place with enough clearance to join the cables together safely, we jump up on the ladders and individually connect the cables as they are labelled. Some connections are quick plug connections, similar to how you would plug in a regular extension cord, however some are much smaller and fiddley. The smaller ones screw together with little terminals, which can take a bit longer. In reality this looks like a small army of people on ladders connecting the veins of the house together so the Desert Rose can be revived in her temporary home, Dubai. Once that’s completed I give the go-ahead. Then and only then can the roof module go on to be properly installed. Now everything is connected, I’ll be doing a once-over of everything tomorrow, before getting our electrical board finished and set up so that on the day after that we can get power to the house and start testing everything! Following that we will install the solar PV system and begin producing all of the energy requirements for the house. We are a step closer to breathing life back into this beautiful, innovative and purposeful home. Let’s not forget that while this is a competition, this is more an avenue for us to broadcast how smart, sustainable houses can be beneficial to those living in them, not matter the age. It is also a showcase on how innovative technologies can not only benefit the occupants living in the house but the environment as well. Anyway, back to work from me, I will be checking back in with another update in a couple of weeks after far too many coffees and far to little sleep. Peace!